16 Mile Brook got its name from its distance to Coral Harbour. It is a popular nesting ground for owls. Hunters must cross this brook when traveling which can be a problem if water levels are high. There are many outpost camps and tents in the area, which is known for its good fishing and hunting. 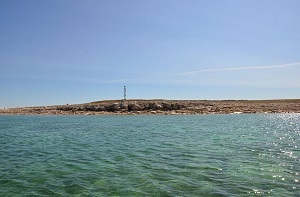 Bear Island is located a few miles from Coral Harbour. It is best known for its tower which can be seen from far. It is also a popular place for carvers. The island’s white coloured rock provides beautiful limestone which creates wonderful carvings, especially for polar bears. Accessible by boat during the summer. Coats Island is located about 140 km (90 miles) south of Coral Harbour. Walrus are often sighted lounging on the island’s rocks. Seals are abundant. Even polar bears coast the Island for food. The Island is also well known for its bird population. At the towering Akpa cliffs, you can observe flocks of Thick-Billed Murres, gulls and black guillemots. The best time for bird watching is the month of June. Boat Tours are organized to visit Coats Island as well as Walrus Island. Allow 3 to 5 days for the tour. For more information on boat tours, check the Guides, Outfitters and Tour Operators information. Please contact the Community Economic Development Officer (Contact us page) for a list of licenced Outfitters. Duke of York Bay is located in the northern tip of Southampton Island. To some residents, this part of the island has been compared to a Paradise because of its beautiful scenery, steep cliffs, and its rich wildlife resources. Duke of York Bay can be reached by boat or aircraft equipped with tundra tires, or even by ATV, although the latter usually takes 2 days of traveling. A Tourism Study on the potential of Southampton Island was conducted in the summer of 2002. As a result of this study, a road is being built from Coral Harbour to the Duke of York Bay area. This trail currently measures 150 km from the community and is the longest access trail in Nunavut. This will allow residents to fish and hunt and allow tourists to visit the area. The East Bay Bird Sanctuary is located on the southeast coast of Southampton Island about 50 km (30 miles) east of Coral Harbour. The Sanctuary was established by the Canadian Wildlife Service to protect the breeding habitat of large numbers of Lesser Snow Geese and many other water bird species. The Sanctuary covers 1,165 km2 of land and marine waters of the Bay. A small Island in East Bay also provides prime nesting ground for Common Eiders. Many other birds pass through the Island’s Sanctuaries including, Atlantic Brant, Canada Goose, Tundra Swan, Northern Pintail, King Eider, Oldsquaw, Red-throated Loon, Pacific Loon, Black-bellied Plover, Semipalmated Plover, Whimbrel, Red Knot, Sanderling, Herring and Sabine’s Gulls, Arctic Tern, Black Guillemot and others. 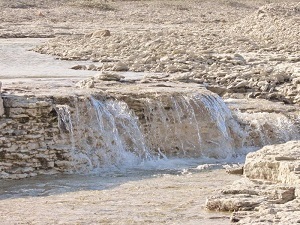 Fossil Creek is located about 16 km (10 miles) from Coral Harbour, near the airport. It has a little creek, a popular swimming area in the summer. The creek is best known for its fossilized coral dating many thousands of years ago. Fossilized shells can easily be seen when walking through the creek. The Harry Gibbons Bird Sanctuary is located on the southwest coast of Southampton Island about 150 km (85 miles) west of Coral Harbour. It covers 1,490 sq. km including the delta of the Boas River and part of the Bay of Gods Mercy. This Sanctuary was also established to protect prime goose nesting and habitat. Numerous ponds and lakes and wetlands are near the Boas River. At least 18 species of mammals have been recorded in the island’s sanctuaries. They serve as a wintering area for Walrus, Polar Bears, Beluga Whales, Harbour Seals, Bearded Seals and Ringed Seals. Bowhead Whales and Narwhals are also spotted in these areas. Caribou, Arctic Wolf, Arctic Fox, Red Fox, Brown Lemming and Collared Lemming also travel in the sanctuaries. A bridge was built to allow hunters to cross the river during the summer. The bridge is very important for the caribou harvest and fishing every year. Gyrfalcons, Peregrine Falcons, and Ravens nest on the cliffs near the mighty Kirchoffer River. Kirchoffer Falls is located about 24 km (15 miles) from Coral Harbour off the airport road. It is well known for its 25 foot falls and its beautiful scenery. The falls are accessible by truck or ATV. 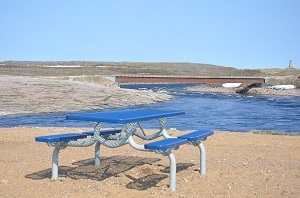 A picnic area is located near the falls. 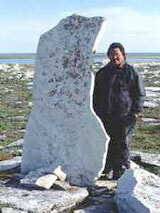 Native Point is a large Sallirmuit camp site located 64 km (40 miles) southeast of Coral Harbour. This archaeological site is often called the Lost City of the North. Originally an important Thule hunting and dwelling site, it was occupied until the 1960’s. It can be reached by boat in the summer or by snowmobile or dog team in the spring. A winter visit is not recommended because the site is snow covered. Set on a high peninsula, you will find row upon row of semi-subterranean houses, many bone and animal parts. Here, you really get a taste of the life of the Sallirmuit People of the Thule Culture. For more information on boat tours, check the Guides, Outfitters and Tour Operators information. Please contact the Community Economic Development Officer (Contact us page) for a list of licenced Outfitters. 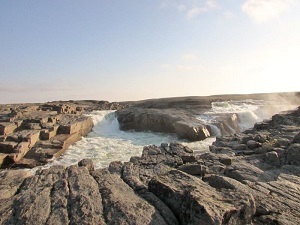 Rocky Brook is located about 16 km (10 miles) from Coral Harbour, in direction of 16 Mile Brook. This is another brook hunters must cross when traveling in the area. The Brook can easily be reached by ATV or snowmobile. There are many Coral Harbour residents who set up outpost camps in the summer near this area. 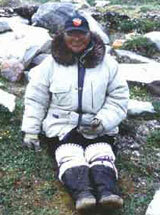 It is a popular hunting and fishing area for Seal, Beluga, Polar Bear and Arctic Char. Ruin Point is a large Sallirmuit camp site located 60 km (36 miles) southwest of Coral Harbour. Many residents of Coral Harbour visit this area by boat or ATV for hunting. Caribou and Polar Bears are often near the ruins. A large beautiful flat stone has been standing on the site for many years. You will find sod houses, many bones, animal parts and get a taste of the life of the Sallirmuit People of the Thule Culture. Check the Guides, Outfitters and Tour Operators for more information on Tours to Ruin Point. Please contact the Community Economic Development Officer (Contact us page) for a list of licenced Outfitters. 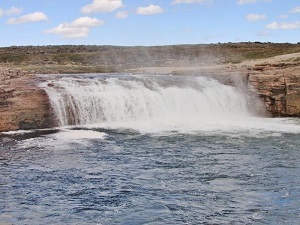 Upper Falls are located upstream on the Kirchoffer River about 16 km (10 miles) past the airport. Many residents prefer these falls because of the beautiful surroundings. The falls are accessible by ATV. The Falls also have a unique design, with the falls splitting up the middle to re-join at the bottom of the river. It is a beautiful area to spend an afternoon relaxing and fishing or even cliff diving for the adventurous. Walrus Island is located about 95 km (60 miles) south of Coral Harbour. It is a small island best known for its Walrus population. Boat Tours are organized to visit Walrus Island as well as Coats Island. Allow 3 to 5 days for the tour. For more information on boat tours, check the Guides, Outfitters and Tour Operators information. Please contact the Community Economic Development Officer (Contact us page) for a list of licenced Outfitters.